The first CPP Advanced Masters in Australia graduated after completing CPP Levels 6 and 7 (Strategy & Leadership). The programme featured a very topical case study - RIM (makers of Blackberry) - and developed both a rescue plan and development path to save the ailing company. Using the new CEMMethod® (http://www.cemmethod.com) the team explored the processes associated with product acquisition and use, producing an innovative design that reduced costs, grew revenue (18 fold) and improved customer service. Not bad for two days effort! If you would like to engage in the BP Groups CPP programme® do visit http://www.bpgroup.org/certification-by-city.html and learn more! Owen Martin, Lisa Dunn, Graeme Jell, Jeffrey Hill and Anil Kumar. Australia and New Zealand now features more than 700 qualified BP Group Certified Process Professionals® with BP Group Licensed Coach Jason Edlin leading the BP and Frame Group team across ANZ. 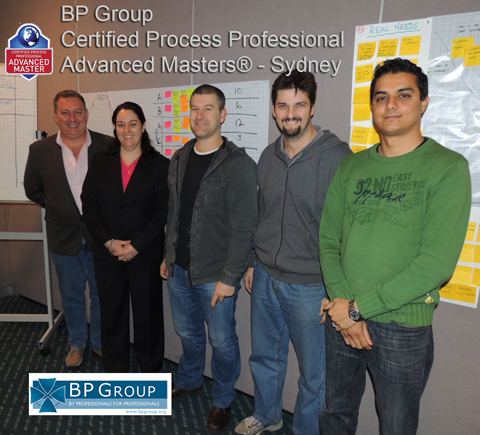 The first CPP Advanced Masters in Australia graduated after completing CPP Levels 6 & 7 (Strategy & Leadership). The programme featured a very topical case study - RIM (makers of Blackberry) - and developed both a rescue plan and development path to save the ailing company. Using the new CEMMethod® (http://www.cemmethod.com) the team explored the processes associated with product acquisition and use, producing an innovative design that reduced costs, grew revenue (18 fold) and improved customer service. Not bad for two days effort! If you would like to engage in the BP Groups CPP programme® do visit http://www.bpgroup.org/certification-by-city.html and learn more! Australia & New Zealand now features more than 700 qualified BP Group Certified Process Professionals® with BP Group Licensed Coach Jason Edlin leading the BP & Frame Group team from Sydney.